Today was a sight-seeing day as well as a night out for us. We have been spending so many days out sightseeing and driving that we haven’t done much in the evenings. In fact, we haven’t watched a single sunset since we started this journey. Tonight, we decided to remedy that situation! We started the day (late) in Old Town. Peppered with galleries, boutiques and souvenir shops, Old Town is a quaint historical district with a huge plaza, church and stores galore. It was a hot and dry day, and we spent much of it in the sun. The pups were in their stroller, once again eliciting interest and chuckles as we walked along the busy streets. Mexican Pizza at the Back Street Grill. Delicious! Jasmine and Juliet were especially flirty today. Even Jasmine, who is usually shy, came out of her shell to look around! I made reservations at the High Finance restaurant at the top of Sandia Peak. We drove over to the base of the mountain, passing the Sandia Casino on the way. We first had a quick drink at the Mexican restaurant at the base (yummy Coconut Margarita) and then took the tram up to the top. Even though the day was hazy, it was a dramatic and breathtaking view. I didn’t feel nervous…being enclosed in the gondola was fine. But it was a 2.7 mile trek up to the summit–a whopping10,387 feet! We got to the top and took in the view. It was about 60 degrees up top, while at the base it was still in the high 80’s! We got to the restaurant, and after a hassle about our reservation (GRRR), we were seated a few minutes later. The food was okay, but the view was fabulous. Let’s face it…people don’t come to the restaurant for the cuisine. The Green Chile Beef Stew (soup) was pretty good. We watched a spectacular sunset and then headed down the tram to the base. 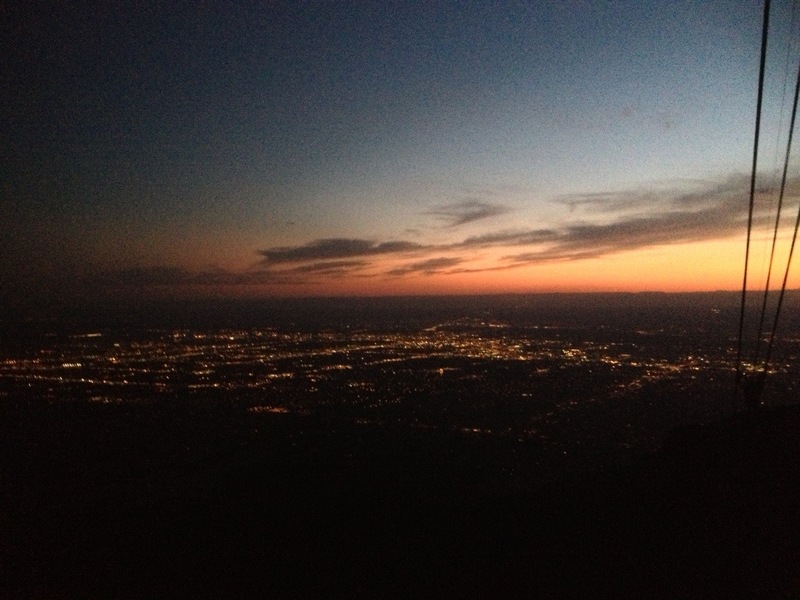 It was getting dark, and we once again had a breathtaking view–this time of the twinkling lights of Albuquerque below. On the way back to the hotel, we stopped at the Sandia Casino. One foot into the front door and we were hit with the heavy smoke. Ick. The casino was bustling with people and was mostly comprised of penny slots. But given that a max bet is generally a dollar or more…it’s not really ‘penny’ slots! We stayed a few minutes (aka $40) and went back to the hotel. Tomorrow, we’re kenneling the dogs and heading to Acoma Pueblo. They have a craft fair and native dancing for the Memorial Day weekend; we’re really looking forward to experiencing this pueblo!